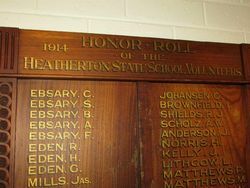 The Heatherton State School Honour Roll commemorates past scholars of the school who enlisted in World War One. Last week there was a crowded attendance at the above school for purpose of taking part in the ceremony of having an honor roll unveiled. Mr J. Shields, chairman of the school committee, presided. In his opening remarks the chairman emphasised the importance of the occasion. Quite a number of old scholars of the school had enlisted and the school committee together with residents thought that their duties should be recognised in some practical way as an example to the younger generation. 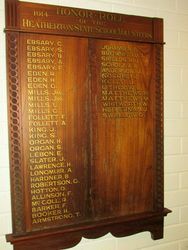 A very fine honor roll had been secured which bore the names of those who in years gone by had attended the Heatherton school and were now in the firing line. The honour roll was unveiled by Mr Snowball M.L.A. Moorabbin News (Vic), 27 October 1917.